When I upgraded to iOS 5 from iOS 4 one of the things I liked instantly was its iMessage service. Apple introduced iMessage, a new capability within your iOS device’s Messages app that can send text, picture, and video messages to other iPhones without counting against your carrier’s messaging plan. What’s more, iMessages actually works with any device running iOS 5, meaning iPad and iPod touch (&iMac) owners can get in on the messaging fun, too. Though iMessage is useful from the get-go, a few tips can make the feature far better—though you’ll need to point your iMessage-using friends to this story as well to benefit the most. 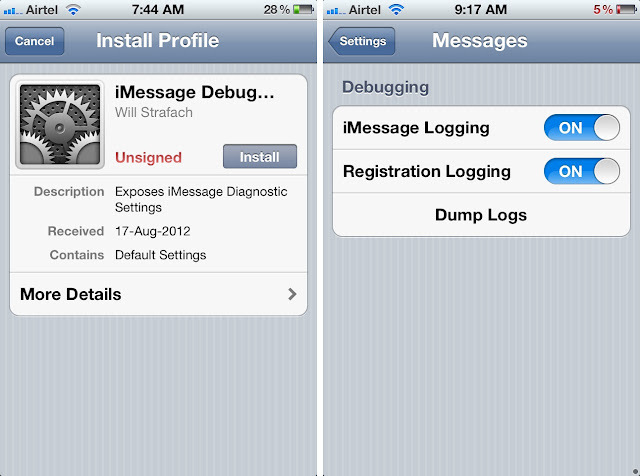 Wondering how to setup iOS 5's new iMessage service on your iPhone or iPod touch or iPad? Here's how to get started. ➡You can toggle various options on and off such as read receipts, character count etc. 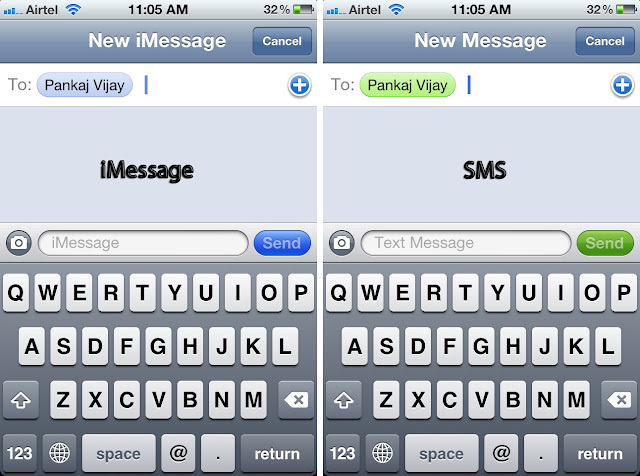 That is all you need, you now have iMessage set up on your iPhone/iPad or iPod touch. Ok now we have iMessage set up there are a few things to consider. If you only have one device then you are fine. If you have multiple iOS 5 devices then you will need to think about how you want them to work. Do you want separate iMessage accounts for each device? More than likely, you would want one account that stays in sync across all of your devices. If you want separate iMessage accounts for each device, you will need to create separate Apple ID's for each device, these can be created for free in the iMessage original set up screen. Just select Create New Account. If you want to have all devices use one iMessage account then you need to input the same Apple ID details into each device iMessage setup page. If that sounds confusing, don't worry. With iOS 6, set for release this September, Apple will allow you to "merge" your iPhone phone number and Apple ID so all your iMessages will go to all your devices, regardless of whether or not they're sent to your phone number or email address. To make it easier to tell the difference, Apple color codes all iMessages with blue bubbles, and all SMS/MMS messages with green bubbles. 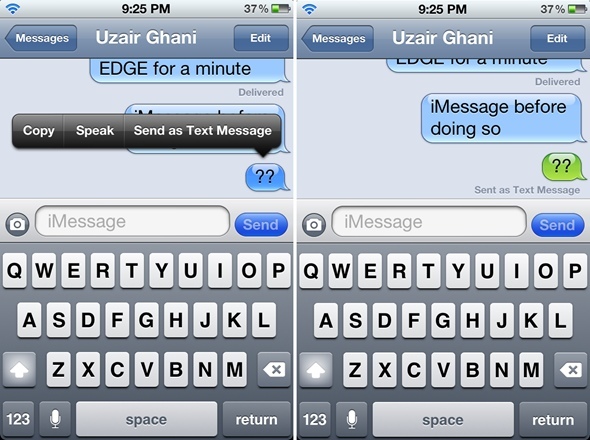 If you send a message and the bubble around it is blue, you're using iMessage. If the bubble is green, you're using SMS/MMS. If iMessage is offline, your iPhone may try to send over SMS/MMS, so keep an eye on it if you want to avoid charges, especially international charges outside of any texting plan you might have. Once you're set up, you're ready to go. If you've ever sent a text message with your iPhone, you already know how to send an iMessage -- it uses the same Messages app. If you're brand new to the iPhone, or to iPod or iPad, here's how it's done. ➡Tap the new message button in the top right. ➡Tap the blue "+" buttonin the upper right hand corner to choose which contact you want to iMessage. ➡Scroll through your contacts and tap on the phone numberor Apple ID email addressyou'd like to send an iMessage to. ➡If your contact is using an iMessage-enabled device, the send button will turn blue**. You may also notice that you can start typing someone's name in the 'to' field and a blue bubble will auto-populate next to addresses or phone numbers that are iMessage ready. If your contact isn't using iMessage and you're sending to their Apple ID email address, you'll see a redbubble around their name with an "X" next to it indicating that it's not a valid iMessage address. ➡Type in your message and tap send. That's it! 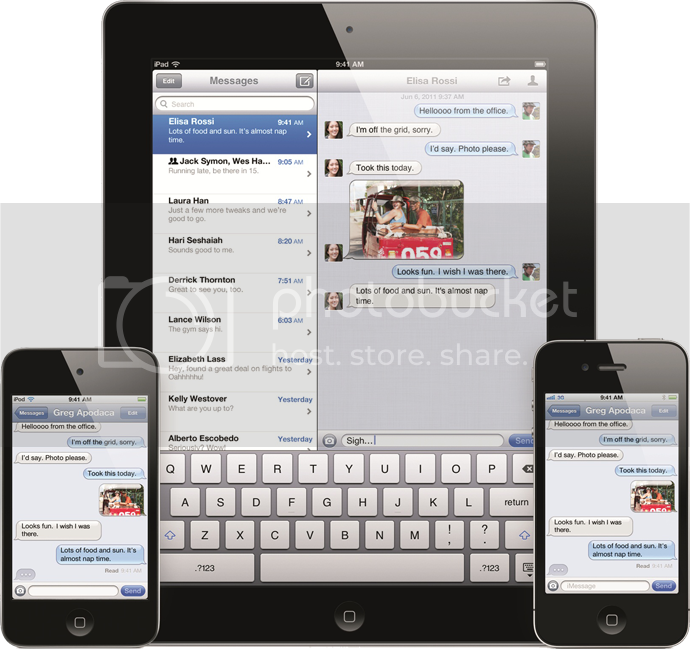 You've just sent an iMessage from iOS! Now, iMessage does one problem I’ve noticed over the past few months, and it’s a big problem considering what type of user you are: if the recipient is a registered iMessage user but is not connected to Wi-Fi or don't have cellular data activated then your iMessage will remain stuck in limbo for extended periods of time before your iOS device decides to send it out as a text message. This has been a source of miscommunication for many (including me) and, luckily, we’ve come across a workaround for it, and it’s a very genius method which we never knew existed before. I have a handy tip and here’s how it works: if you send out an iMessage but it does not show “Delivered” under blue ellipse, you can double tap or tap and hold the message until you see an option that says Send as Text Message. Tapping that will send out the same message through your cellular network. How simple was that? This doesn’t work during the time when you see a Sending message in the navigation bar, so if you have questionable cellular data coverage you’ll have to wait for a bit. I personally never knew I could manually send a text message (save for turning off Wi-Fi and cellular data) so this tip is pretty useful for me. And to be quite honest, it’s a very, very handy technique to send out a message to a concerned recipient if you have something important pending on your list. I hope you find it useful as well. There are a host of hidden debug settings in iOS that developers, security researchers, hackers, and others use to analyze data and fix errors. While most normal users won’t care to look through their iMessage logs, the more inquisitive may feel dangerous enough to try. What you do with that information is entirely up to you, but there’s definitely some room for learning and exploration here. Once you’ve installed, the new diagnostic settings will appear under each associated section of the iOS Settings app. You export logs to be examined in tools like Apple’s own Xcode for Mac. You’ll need to sync your device with iTunes and then look in Library/Logs/MobileDevice to find the log data. No jailbreak is required to use these, but thanks to the renowned jailbreaker Chronic for bringing the debuggers to the public. Having all of your iMessage conversations sync across your iPhone / iPad / iPod / iMac automatically allows for a seamless experience when frequently switching between devices. 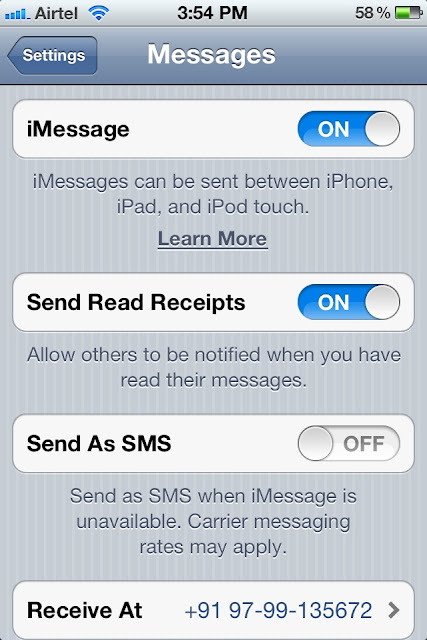 So, let's how to ensure your messages will be synced, at least till iOS 6 not come. The thing is you have to Make Sure to set your e-mail address as your Caller ID in iPhone. Doing so will allow you to send and receive iMessages from your e-mail address, instead of your phone number. You will still receive an iMessage sent to your phone number, but when you reply it will be sent from your e-mail address. you will need to add the same e-mail address you added on your iPhone to all other iOS devices and then set that as the Caller ID, the same way we did on the iPhone. That's all there is to it. Going forward, your iMessage conversations should sync between your iPad and iPhone (or iPod Touch) almost instantly, assuming they are both connected to some sort of cellular or Wi-Fi network. You can do group messaging in iMessage. This is as easy as creating an iMessage session and adding all the users you want to include in the chat. Again, they must have iMessage, so this may not be all that commonly used until all your friends have the service. As mentioned earlier in the message settings you can find an option "Send Read Receipts" by enabling this the sender of the message know when you read the message. This is quiet handy when a continuous conversation going on. Another cool thing about iMessage is the indicators that let you know that both users are on the service. 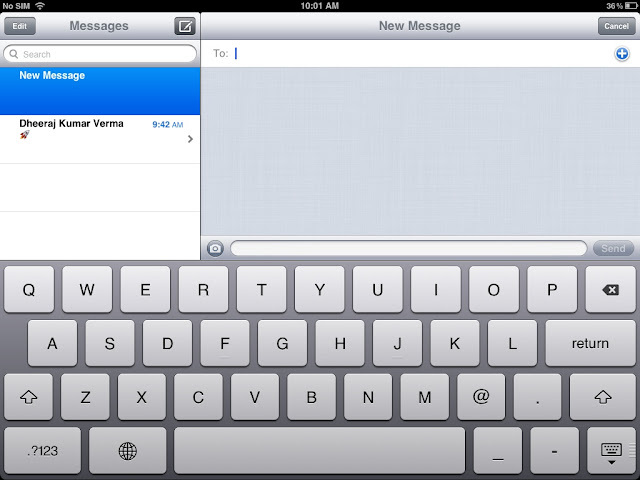 The speech bubbles will be blue and it will say iMessage in the input field. This is nice, because you can also know whether or not you are using standard text instead of iMessage (when Send as SMS option on). Last but not the least, I cover some quite quick writing tips in my earlier post in which some also applicable on iMessage like, Shortcuts,Period,Caps etc. We’re sure there will be more to discover soon. If you find some interesting stuffs, Drop me a line or leave a comment below.